Why do the leaves on my dogwood tree look like they are wilting? It was planted about 7 years ago right by my deck which gets full sun just about all day. What can I do? There are many reason that this could be happening. But, this year, gien the dry hot conditions, I would suspect that a lack of water is the most likely culprit. I would give the tree a good long watering and then continue to water it for the next several weeks. 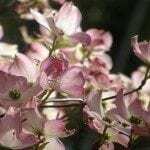 Dogwoods are meant to be forest border plants and they are fine under normal conditions if they have no shade. but in very hot and dry conditions, they need extra water to do well.